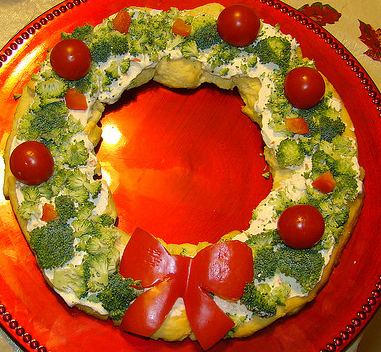 This festive and delicious wreath appetizer (who doesn't love crescent rolls?) was featured in Taste of Home magazine. If you're looking for the perfect appetizer for this weekend's Christmas parties, this one will be a hit! Remove crescent dough from packaging (do not unroll). Cut each tube into eight slices. Arrange in an 11-in circle on an ungreased 14-in pan. Bake at 375 for 15 – 20 minutes or until golden brown. Cool for 5 minutes before carefully removing to a serving platter; cool completely. Made this today for a party. It was beautiful and very delicious. Got lots of compliments. But when I make again I will slice the rolls in thinner slices. I think it was a little too much bread. Hi, i just want to say that your Christmas Appetizers looks delish. I'm happy to have stumbled onto your website. Nice share!